Friday morning I woke up feeling surprisingly good considering how much alcohol had been coursing through my system just a few hours earlier. Cousin Tony had been good enough to take the day off from work to take me around town, and he picked a terrific spot for lunch- Out The Door. This is the sister restaurant to Charles Phan’s acclaimed Vietnamese restaurant The Slanted Door. The food at Out The Door is simpler, less expensive, but still excellent. Especially after a night of boozing and all you want is a nice bowl of noodle soup. The restaurant is located in the Westfield Centre in downtown San Fran. Yes, it’s in a mall. But trust me, the food is good. The broth in their Pho was soul satisfying and their seafood was delicately cooked to let the fabulous quality of the fish itself shine through. What a perfect lunch. After lunch we hit Peet’s Coffee which was my favorite coffee in the Bay Area at the time. More on why I use the past tense for that statement in a later post. For those who haven’t tried it, Peet’s is a big, bold ultra-strong style of coffee, similar to the Mud Truck in NY. People usually love it or hate it. I like it. After a lot of walking around SF for much of the afternoon we ended up at restaurant One Market across the street from the Ferry Building. Two excellent signs, literally, bode well for us- a banner indicating that they were running a month-long wine promotion, and a plaque showing they possessed a Michelin star. The wine special was simply unbelievable- 50% off the price of all bottles. Browsing thru the wine list it appeared their regular prices were at 100% markup, so essentially their special was equivalent to no-corkage. And with a wine list as broad as theirs is and the quality of wine service they provide, this was an incredible deal. 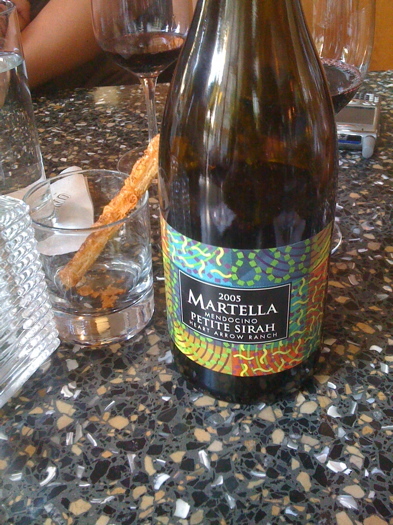 We started with a bottle of Roederer champagne, made the big leap to a bottle of The Prisoner, and then took the server’s recommendation and tried a 2005 Martella Petite Sirah from Mendocino. Awesome selection. This was probably the best wine discovery from the entire trip. At $70 (cut to $35 with the promotion, which is retail price at any wine shop), this wine was fantastic. A big, rich wine to be sure, it’s got tremendous intensity of fruit, think blackberry and cherry, but somehow well balanced and not overly tannic. Petite Sirah like this can make me forget my usual favorite varietals of cabernet and zin. One word of warning though- this wine will stain your teeth like nothing you’ve ever seen, so when you’re smiling because you love what you’re tasting, you will also look like you just ate Grimace. That was definitely an awesome special at One Market. Thanks again to Kenny for picking up the tab. Hope it was a blast on ur “21st” B-day.